The Chester altar is interesting because it syncretizes Taranis (spelled Tanarus) with Jupiter Optimus Maximus, or Best and Greatest, the Roman god at his most imposing and official. As we shall seem Jupiter and Taranis were often paired. Another altar, from Alt Often in Hungary, is also dedicated to Jupiter Optimus Maximus Taranucus. The image above, from Le Chatelet, Gourzon, Haute-Marne, France is probably of Taranis, and blends his attribute of the wheel and Jupiter’s thunderbolt. Taranis statuette from Le Chatelet, Gourzon, Haute-Marne, France. From balkancelts. While Jupiter (and Zeus) both have names meaning essentially “God”, Taranis, like Thor, Donar and the Baltic Perkunas, means simply “Thunder”. His name comes from a Celtic root *taran- meaning “thunder, thunderstorm” and is related to the Welsh, Breton and Cornish taran, thunder. His name goes right back to Indo-European roots. For a long time, scholars of the Roman empire tended to think that the Romans came along and interpreted the local deities to suit themselves. Certainly, an inscription to Jupiter Taranis suggests Roman influence. But over the last 20 years scholars have turned this idea around, studying the interpretatio celtica, or how the locals interpreted Roman deities to match up with theirs. Perhaps Jupiter was the nearest thing to a thunder-god the Romans had. Another image of Jupiter shows how the influence could go both ways. While the statuette above shows the god Celtic-style, with trousers and bare chest, another statue from Vaison shows the god in toga, with Jupiter’s eagle on one side, and Taranis’ wheel held against his other leg. The ninth-century Berne Scholia, which is an annotated version of the Pharsalia, expands on this, saying that Teutates (Mercury) and preferred drowned victims, Esus (Mars) preferred hanging while Taranis (Jupiter) liked burning. Since both Julius Caesar and Strabo described the Gauls burning victims in a “wicker man” it has been assumed that Taranis was the god they being sacrificed to. 18th century imagining of a wicker man. Wikimedia. How did they cram them all in? Other commentaries said that Taranis was originally offered human heads. (Duval 1989: 277) Whether the Gauls ever did offer elaborate human sacrifices to these three gods, many Roman writers and others using them as sources believed that they did. One symbol often associated with the cult of Taranis is the wheel. 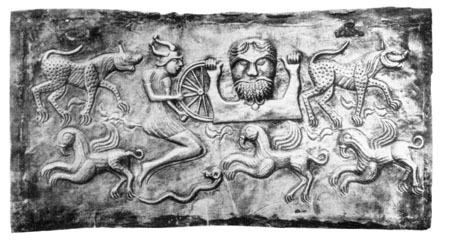 Images of him holding the wheel are common enough that some have identified the bearded god on the Gundestrup Cauldron with him. Votive offerings of little wheels are common throughout Celtic areas in the Bronze Age, and have been found in a shrine in Alesia, in the Seine, and buried in tombs. You might wonder why a wheel, since they’re usually identified with the sun. Taranis could have been a sun-god as well, or a sky-god generally, although neither fits well with his name. Miranda Green argues that Taranis and the Wheel-God are separate beings, since the wheel must be a solar symbol. Germanic lore said that the groaning of thunder was caused by Thor’s wagon wheels and lightning was sparks they struck as they went. (If you imagine an old-fashioned wooden wagon with wooden wheels, you can see the logic of it.) Grimm (166) offers many examples, from both Germanic folklore and others’, of this idea. Lightning also took the form of a wheel: the Indian epic the Mahabharata has a wheel that spits lightning bolts when it turns, and a fiery discus with a pole through the centre, probably a form of the Sudarshana Chakra. In Slavic folklore “thunder-marks“, rather like the hex marks of the Pennsylvania Dutch, include a circular one symbolizing ball lightning. Or, to come at this from another angle, perhaps by Roman times the Bronze Age symbol of the wheel had become a sort of general symbol of good fortune and blessing, such that it would not seem incongruous besides a thunderbolt. Thor’s hammer was both a symbol of thunder and blessing, so perhaps the Gauls wished to indicate something similar by putting the two together. Our picture of Taranis is contradictory: the wheel and thunderbolt could both indicate a benevolent deity, and his assimilation to Jupiter suggests a majestic god, but the written sources say that he was a “master of war”, who could be assimilated to Dis Pater as well as his celestial brother, and desired human sacrifice. This last may be just Roman propaganda, and perhaps we would be better off thinking of him as a benevolent warrior armed with a thunderbolt, like Jupiter smiting the Titans, whom Virgil describes as “cast down by a thunderbolt”. Duval, Pierre-Marie 1993: “Taranis,” trans. Gerald Honingsblum, in American, African and Old European Mythologies, compiled by Yves Bonnefoy, University of Chicago Press. Green, Miranda 1979: “The Worship of the Romano-Celtic Wheel-God in Britain seen in Relation to Gaulish Evidence,” Laotumus (Apr.-May 1979) 38/2: 345-67. The featured can be found here. This article was originally published on We Are Star Stuff.